André Apaid, Jr. is one of the leaders of the Group of 184 which forced Jean-Bertrand Aristide from power in 2004. Evans Paul also called K-plimo was elected mayor of Port-au-Prince in the 1990. He was one of the leaders of the Convergence Démocratique that contributed to the 2004 Haitian coup d'état which overthrew Aristide. Uniting the forces of the U.S. government, at that time the Bush administration, the elite class of Haiti, and worldwide republican institutions, The Convergence Démocratique, an amalgam of over 200 groups, worked to oppose the then President of Haiti, Jean-Bertrand Aristide. 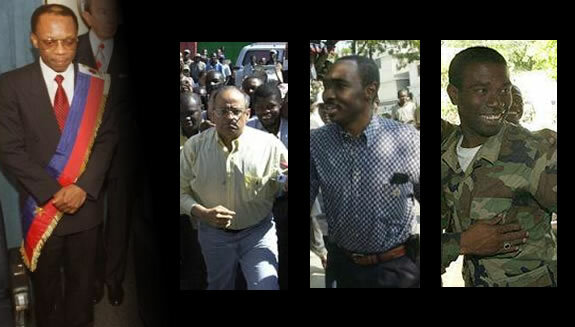 The group, led by a one-time Aristide supporter and former mayor of Port-au-Prince, Evans Paul, Andre Apaid, and Guy Philippe, would eventually get him out of power. In their campaign, they openly asked the U.S. to invade the country, get rid of the then president, and rebuild the army, which had been disbanded. The convergence was dissolved after they attained their feat following the coup that ousted Aristide.